Among the eternal questions that plague the machine embroidery community, the question of which thread is best is probably the one heard most often. Sometimes the question involves what type of thread works best, and sometimes it centers more on which brand of thread is best, but the answer required always centers around a comparison and a qualification, something has to come out on top as “the best”. A couple decades ago, the answer to the which thread is best question, at least when it came to type of thread, would have been rayon. Made from regenerated cellulose, rayon was the thread of choice for a lot of embroiderers back in the day. It had great shine and made embroidery pop, but it wasn’t necessarily a strong thread, or a washfast one. Still, for a long time, it was the only game in town. Polyester, in the time when rayon was king, was primarily a matte thread, dull and not considered a show piece thread. 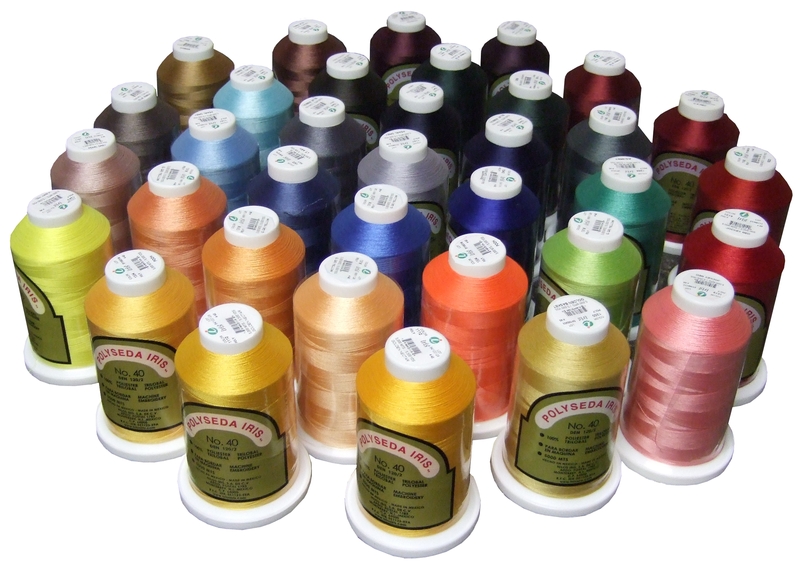 Over time, though, manufacturers, like Hilos Iris, started working on creating a polyester thread with shine. They also worked on strength and durability, using trilobal fibers to make the thread both stronger and shinier. The result was a polyester thread that could beat rayon at its own game, a thread that equaled rayon in shine, but exceeded it in colorfastness, washfastness and strength. While there are still die hard rayon users in the embroidery world, a lot of embroiderers have switched to polyester. Once an embroiderer settled on what type of thread to use, the next question to be answered was which brand was best. As with the rayon/polyester debate, the choices for a brand of thread started out narrower and expanded over the years. Madeira and Robinson Anton are brands that have been around for a quite a while. American and Efird has been around for over 100 years. Coats and Clark, in one incarnation or another, has been around for quite a while as well. As time went on, new brands entered the market place. Iris thread, a trilobal polyester was introduced to the American market in 2007. Fil-Tec introduced their Glide thread. Companies started bringing in and selling cheaper thread from the Pacific Rim. Suddenly, embroiderers were spoiled for choice. The question about which thread was best was heard more and more often. The simple answer to the question of what thread is best is this: the best thread is the thread that works most efficiently for you. Different threads will sew out differently depending on what machine is being used. The fabric being sewn, and how the design is digitized can also have an impact on how well a thread works. The durability, colorfastness and washfastness of the thread should also be considered. Thread breaks that slow down productions, or colors that run can lead to lost business and lost time. The biggest mistake embroiderers make, in my opinion, when considering which thread is best for them is placing price at the top of the list of things to consider. Many shops may operate on strict budgets and price will need to be factored into the purchasing decision, but placing price before how the thread sews out, or giving price more weight than the durability of the thread, or settling for a thread that isn’t colorfast because it’s a thread that’s cheap accomplishes exactly the opposite of what’s intended. Not all cheap thread is bad thread, and not all expensive thread is great thread, but the likelihood that a thread that costs more will also have more time, effort and quality materials in its construction should not be ignored. One way to gather data for your decision about which thread is best for you without breaking your budget is to ask the thread manufacturer for a sample you can test. Most manufacturers or distributors will be happy to send out a sample. If you’d like a sample of Iris thread, please contact us and we’ll be happy to get one out to you.